As the United States approaches the critical November 6th midterm elections, Democratic candidates convey three themes: costs, wages, and corruption. 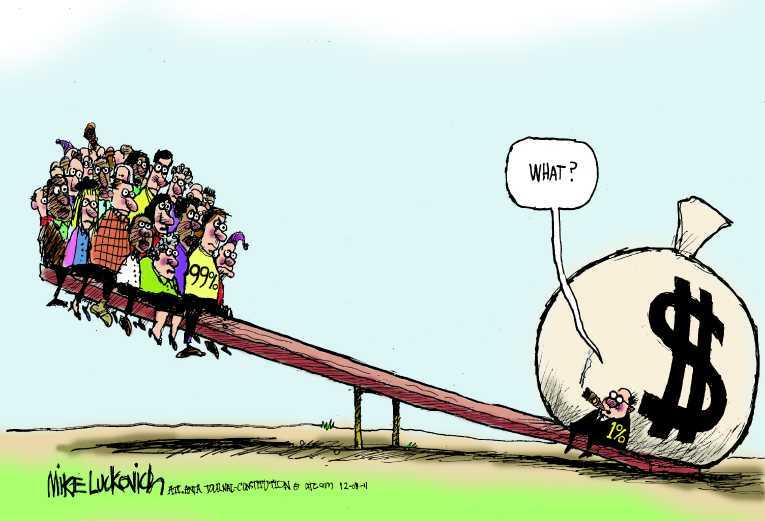 While aspects of the corruption theme are readily apparent — almost every week some Republican big wig is indicted for corruption, what has been lacking is a “big picture” proposal to address inequity. 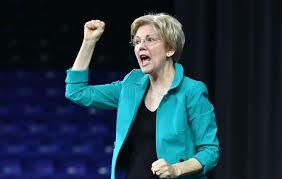 Now, Massachusetts Senator Elizabeth Warren has proposed a sweeping reform of capitalism. To change corporate behavior, Senator Warren’s Accountable Capitalism Act has four components. 1. Charter Reform. “Big corporations that make more than $1 billion a year in revenue would need to get new charters from the federal government. Those new charters would make it clear that the companies must consider the interests of their workers – and other people affected by the company – not just shareholders.” In other words, corporation would need to consider the needs of their employees; not just the need for equitable wages but other needs such as healthcare and childcare — and environmental safety. 2. 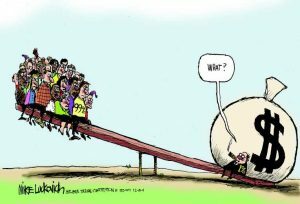 Worker Participation: “Workers would elect at least 40% of board members for big corporations – giving them seats at the table when big decisions need to be made.” It’s estimated that this would affect 3500 public US companies — and hundreds of private companies. Senator Warren’s proposal is likely to get little traction in a Republican-controlled Congress. Nonetheless, it’s an important idea. One that should get the attention of all Democratic candidates. We have to reform American capitalism and Elizabeth Warren has suggested a significant first step. Will the Economy Decide the Midterms? Probably not. But there’s little dispute that the US economy is strong. Since Trump became President, 3.4 million jobs have been created; 7 in 10 Americans say they are doing fine or living comfortably; the official unemployment rate is 3.9 percent; and the stock market (Dow Jones Industrial Average) is up 33 percent. Trump’s problem, and the problem for Republicans in general, is that many Americans are looking beyond the glitzy economic numbers. And, depending upon their Party affiliation, many voters don’t like what they see when they examine their own situation. The July 2nd Quinnipiac Poll (https://poll.qu.edu/national/release-detail?ReleaseID=2553 ) asked, “What is the most important issue to you in deciding how to vote in this year’s election for the U.S. House of Representatives: the economy, taxes, health care, immigration, or gun policy?” Nationally, 27 percent said immigration, 23 percent said the economy, 22 percent said health care, and 12 percent said gun policy. But the preference depended upon political Party: Immigration was the number one issue for Republicans and Independents; for Democrats it was health care. Of course, whether you believe this or not depends upon whether you trust what Trump says. The July 25th Quinnipiac poll contained this question: “Who do you trust more to tell you the truth about important issues: President Trump or the news media?” 75 percent of Republicans trusted Trump; while only 5 percent of Democrats trusted him. This economic imbalance is why it’s a good idea for Congressional Democratic candidates to focus on costs, wages, and corruption. Costs because consumer prices are increasing for health care, housing, and energy. Democratic candidates should focus on wages because Trump’s economic policies have increased corporate profits but this hasn’t translated to more money in the wallets of working families. Republican largesse has enabled corporations to raise their dividends, increase CEO salaries, and buy back their stock; but it hasn’t benefited their employees (https://www.usatoday.com/story/money/2018/04/13/how-companies-spend-tax-windfall/505122002/ ). While Trump promised to “drain the swamp,” he’s actually deepened the swamp. The issue of Republican corruption complements the economic issues of costs and wages for two reasons. The first is that an unusual number of Trump associates appear to be corrupt. For example, this week New York Republican Representative Chris Collins — the first member of Congress to endorse Trump — was indicted for insider trading. Also in this week, Trump cabinet member Wilbur Ross (Commerce) was accused of having stolen $120 million at his investment company (https://www.newsweek.com/ross-accused-stealing-120-million-1060598 ) — Ross is also accused of violating conflict-of-interest laws and filing false information. More generally, Trump Administration corruption ties to its economic policy. For example, this week the New York Times (https://www.nytimes.com/2018/08/05/us/politics/nucor-us-steel-tariff-exemptions.html ) reported that the implementation of the steel tariffs has guided by Trump supporters at two large US steel companies, Nucor and US Steel. As another example, Trump plans a coal company bailout that will help some of his biggest donors. (https://www.marketwatch.com/story/trump-sells-regulatory-favors-to-his-donors-2018-06-14 ) And, of course, it’s well established that the 2017 Trump-sponsored tax cuts primarily favored big GOP donors (https://www.politico.com/story/2018/01/29/big-donors-republican-tax-cuts-374842 ). In case you missed it, California is beset with an unusual number of intense wildfires; the state is covered by smoke. In response, on August 5th, Donald Trump tweeted: “California wildfires are being magnified & made so much worse by the bad environmental laws…” Hmm, so California “environmentalists” are responsible for the fires? Or is someone else to blame? Twelve years ago, I wrote “Global Warming? Not in My Back Yard” (https://www.huffingtonpost.com/bob-burnett/global-warming-not-in-my-_b_19380.html ), pointing out that while most Americans are concerned about global warming (climate change), in general, they don’t get excited about it, in particular, until there’s evidence at the local level — because they have a lot of other issues to worry about such as the cost of their healthcare or housing or jobs. 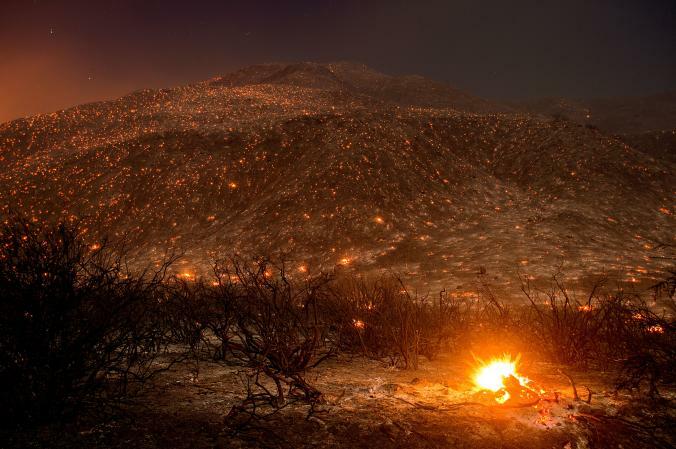 Two years of extreme wildfires has gotten Californians’ attention. Waking up each morning worried about air quality — because of the smoke — or worse yet, wondering if you will be forced to evacuate, has made everyone in California aware that we have a problem. The issue is what to do about it. In Trump’s full tweet, he said: “California wildfires are being magnified & made so much worse by the bad environmental laws which aren’t allowing massive amount of readily available water to be properly utilized. It is being diverted into the Pacific Ocean. Must also tree clear to stop fire spreading!” Even by Trump standards, this was an incredibly ignorant tweet. The wildfires are not being caused by lack of water or the absence of tree clearing. Most experts agree they are the result of dryness — due to the state’s prolonged drought, high temperatures — July was the hottest month ever recorded, and — in many cases — ferocious winds. As a native Californian, I’ve learned a lot about wildfires. (If you’ve lived here for more than a couple of years, you have fire stories to tell.) In October of 1991, the Oakland Hills Firestorm occurred about 12 miles from my Berkeley residence. This fire killed 25 people, injured 150, and destroyed 3280 residences. It covered an area of approximately 3 square miles. In October of 2017, the Tubbs fire occurred about 15 miles from my west Sonoma County property. This fire (spanning Lake, Napa, and Sonoma Counties) killed 22 people, injured more than 100, and incinerated 5643 structures. The Tubbs fire covered a much larger area than the Oakland Hills fire; on its northern edge the Tubbs fire stretched 12 miles. Many Californians attribute the violent wildfires to global climate change. (Last year, California Governor Jerry Brown called extreme fire conditions “the new normal” under climate change.) The most recent California poll (http://www.ppic.org/publication/californians-views-on-climate-change/ ) found that two-thirds of respondents believe the effects of climate change “are already occurring” and 81 percent believe it to be “a serious threat” to the state’s future. Not surprisingly, the attitudes about climate change split along Party lines: only 24 percent of Republicans view climate change as a threat. Notwithstanding climate-change skeptics, most Californians agree that we need to take action to mitigate climate change. One of these is to reduce fossil-fuel emissions. Notably the Trump Administration has just taken steps to reduce California’s ability to do this; On August 2nd, Trump’s EPA revealed plans to strip California of its right to set air-quality rules (https://www.nytimes.com/2018/08/07/climate/california-auto-emissions-trump.html ). The catastrophic impacts of climate change aren’t confined to wildfires on the West Coast, each state has its own unique disaster profile ranging from drought to megastorms. Each state, and each community, will have to develop their own particular response.